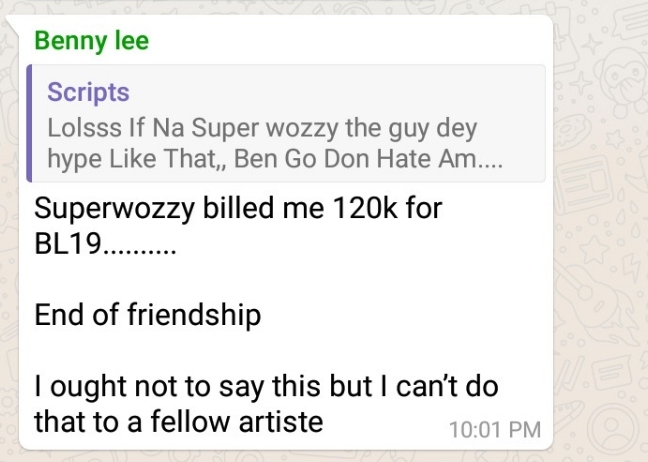 Fast rising music act, Bennylee has revealed that colleague, Superwozzy billed him a whopping 120k to come perform at his BennyLee Live Concert. This was revealed on OSMATV online platform while discussion was ongoing about love for one another in the music industry. BennyLee however revealed that he didn’t pay Superwozzy that sum because he feels Superwozzy is feeling bigger which ain’t supposed to be. In reaction to this, Fast Rising Rap Act and Olamide’s “Who You Epp” First Runner Up Scriptz jumped to defend Superwozzy that he charged that fee because that’s his (Superwozzy) standards and no one should have problems with that. Another Fast Rising Rap Act, Deola never believed that Superwozzy charged Bennylee until he saw screenshots and had the “I’m Dead” reaction. Really?? Yeah!